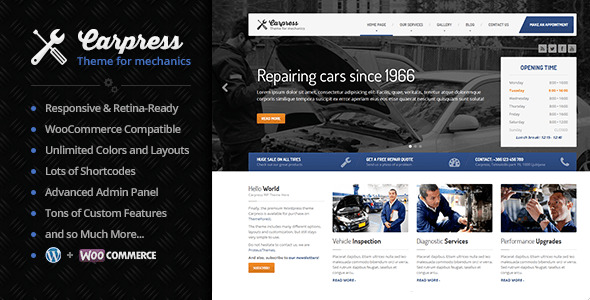 Carpress is premium WordPress Theme for mechanic workshops, car repairs, handymen or any similar local business website. It is very easy to setup and use. Brilliant theme. Very easy to set up and the best support team I’ve ever come across. Even if the theme does not support everything that I require, they point me in the right direction to customize the site in order for it to function the way that my client requires. The site that I am running is for a lighting company and the theme is extremely responsive and clean.The support is FANTASTIC! They have resolved problems and they are quick to respond. I am in the United States, so there answers are responded in the morning or overnight. I have had zero issues with support not answer my questions. They are very helpful! Best theme creators BY FAR! Marko provides outstanding support for this theme. The theme itself is very flexible and doesn’t necessarily need to be used for a mechanics or garages website (I’ve used this for a business theme). I have no hesitations in providing ProteusThemes a 5 star rating. Great Theme, and tremendous support..! A very quick response to the one question I had..! Documentation is great. I will definitely use ProteusThemes again..! Very easy to build automotive theme. Perfect for any auto mechanic clients. Hello everyone. I know most of you are programmers but I work in auto repair and i have to say this is the best theme I have seen. We had a few customers try the website and they said it was very easy to navigate. I feel this theme gives us the same quality website that the big chains have. I recommend this to anyone looking for an auto repair theme. This theme is perfect for our Car Detailing company! As a freelance designer, I’m often faced with clients that have specific needs. I am working with a wonderful client in Basalt Colorado who is using Carpress for their auto body shop … And they could not be happier with the results. The template is very easy to work with and customize. Any difficulties or special requests that I have had have been easily quenched by the wonderful tech support team at ProteusThemes. I can see this template having very many uses beyond supporting a body shop … It is a great template full of customizable options. I highly recommend Carpress, and ProteusThemes. This is a fantastic looking theme and I love how versatile it is. I just have a very very little knowledge in html and i am completely new in wordpress. I was already happy to get the installation of WordPress done…but with capress I could manage to create a completely awesome website for my brothers company . All the theme options word very intuitive…Another wonderful thing is the live customizer … you see directly what part changes when you change it. So if you are also very new in wordpress and html you will also just need some days to create an awesome website ( i also created the content in that time; images and texts). So buy capress and do something awesome! Very good theme! Thank you! People that made this theme have outstanding and super fast feedback! Keep up the good work guys you made a lovely theme! One of the best on the market! Easily configurable and is suitable for every type of sites. Very good support in the shortest time responding to all requests. There is documentation available video and text. Thanks to the developers! Happy to recommend this company and its product to a friend! Love the theme. Think it works well and was very easy to get looking like your demo, which is good because some themes have an amazing demo but its impossible to get it looking anything like it!! Great job guys! The steady stream of added features shows you guys are committed to providing a great service. Add to that the support I received on your Support Page and you’ve got yourselves a return customer. I’ll be looking out for your items from here on out! Not everyone needs WordPress. This template is easy to customise and provides a great asset for anyone in the beauty industry. All the best with future sales and projects. Absolutely recommended theme! A++ customer support, answered all my questions in timely measure. Highly recommended for custom designs! 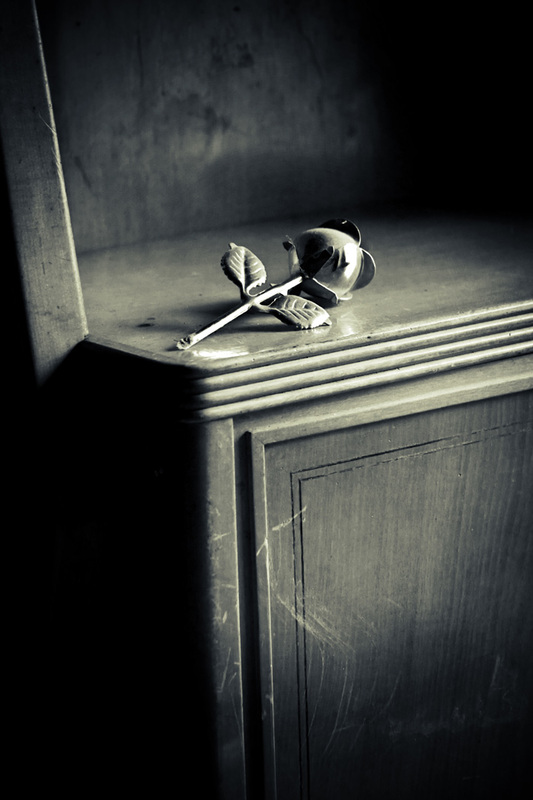 Absolutely stunning theme, highly recommended; 5* – with generosity of help like no other. Coded really well, & would like to see more from this user in the near future – keep supporting!! Do you enjoy our theme? We would be glad to publish what you have to say to others. Just drop us a message from .